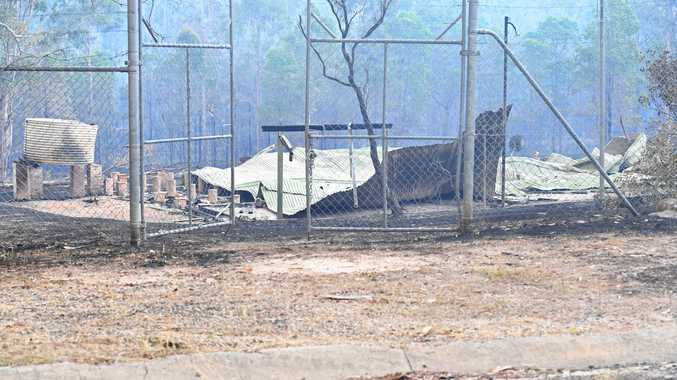 THE discovery of asbestos in waste material from the Jubullum community has raised concern in the wake of the devastating Tabulam bushfires. Casino tip staff found a piece of asbestos the "size of a drink coaster" among twisted tin and debris from the old school at Jubullum. The asbestos was in a Kyogle Council truck which was taken to Casino landfill. There were a few pieces of asbestos in the truck load. According to Kyogle Council general manager Graham Kennett works at the site were stopped, and the incident was reported to Safe Cover and the asbestos sent to a laboratory for testing. "The first thing we always do is assume it is asbestos until it is tested, Mr Kennett said. The laboratory test confirmed the debris contained asbestos. The five staff, all men, had to throw away their clothes and their vehicles were decontaminated, Mr Kennett said. The men underwent lung function testing and will be monitored on an ongoing basis. The waste that went to Casino was diverted to Kyogle where a large hole was dug and the asbestos pieces were buried. Mr Kennett said the review of the incident highlighted a "number of areas for improvement and training". He said staff needed training on asbestos awareness and we need "to question documentation of potential asbestos sites better. Specialist contractors were already on their way to the Jubullum site to attend to the known dump site, and they were sent to the old school site to spray PVA glue to contain any friable asbestos to avoid airborne dust. "We have subsequently found other locations in the Jubullum community where asbestos was exposed by the fire," Mr Kennett said. "These sites are flagged as sites to be cleaned up as part of the disaster recovery process." Asbestos is still present in many homes and buildings and everyone needs to be aware of the risks this product poses, Mr Kennet said. Free asbestos disposal kits for small amounts of asbestos are available from your local council. For suspected larger amounts of asbestos contact a qualified asbestos contractor. Asbestos becomes an issue when it is disturbed or burnt. Kyogle Council were asked to remove the old school house debris at Jubullum before the community returned. Mr Kennett said the old school building at Jubullum was burnt to the ground and the community asked council to remove debris before they returned. "Can you get rid of it so they don't have to look at it when they come back," Council were asked by the Jubullum community. No longer a working school, the old building was where many of the older members of Jubullum went to school. "We had already asked about asbestos on the site," Mr Kennett said. "There had already been asbestos sighted at their dump site near the sewage treatment works." But council was told asbestos had been removed from the school three years ago.